No time…. There’s never any time! Those are the famous words of Jessie Spano of Saved By The Bell. In the most famous episode of all-time where her caffeine pill addiction is revealed and a freak-out ensues. Everyone always calls out the part of the episode where she sings,” I’m so excited! I’m so excited! I’m so… scared!” (because it’s awesome). But the most memorable part of the episode, to me, is when she realizes she needs to wash her hair and study and go sing in her girl band and breaks down when Zack tells her there’s no time. She wails, “No time… There’s never any time!” And I commiserate with her on a level I’ve never commiserated before with a made-up television character. To the point where I find myself saying this exact phrase all the time. At work when I add another project to my list. Every Sunday night when I realize I didn’t get enough done over the weekend. When friends want to hand out. When I see how badly I need to clean the bathroom sinks. There’s just no time. OK, so maybe it’s a little dramatic. I’m not at the point where I’m going to become addicted to caffeine pills any time soon (I’ll take my caffeine in the form of coffee, thank you!) and unlike Jessie, I’m not in a girl band and trying to get into Stanford at the same time (I’d be having a much bigger freakout if anyone expected me to be getting into Stanford or to sing in public)… but there is a lot going on. And I pretty much always feel like I have zero time. Thank goodness most of the stuff in my life is good stuff, but why has nobody invented a way to add more hours into the day yet?? I’m pretty sure you probably feel the same way I do (and if not, you must know magic). But before you start popping caffeine pills and freaking out, try a little chocolate treat. With totally edible cookie dough. This recipe for Chocolate Chip Cookie Dough Cups is super easy to make, so it won’t take a lot of that valuable little thing called time. The only reason they say it’s not good to eat raw cookie dough is because of the eggs. 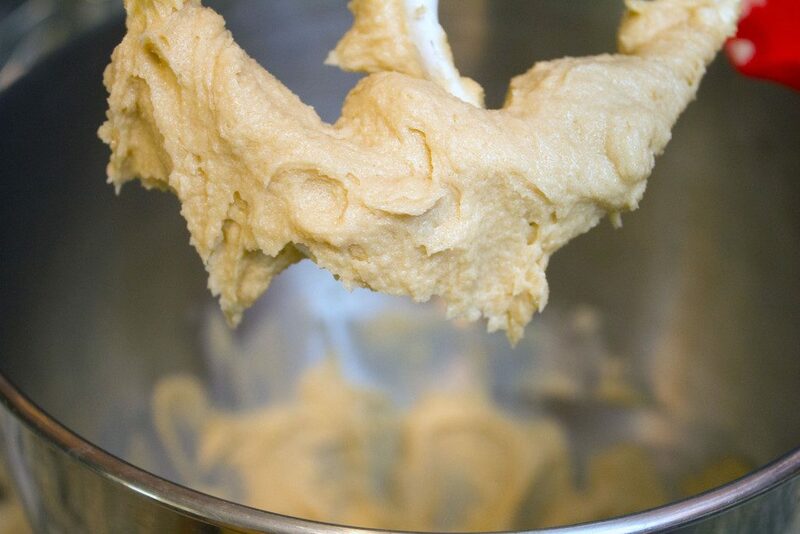 Leave the eggs out of cookie dough and you’re totally good to go. 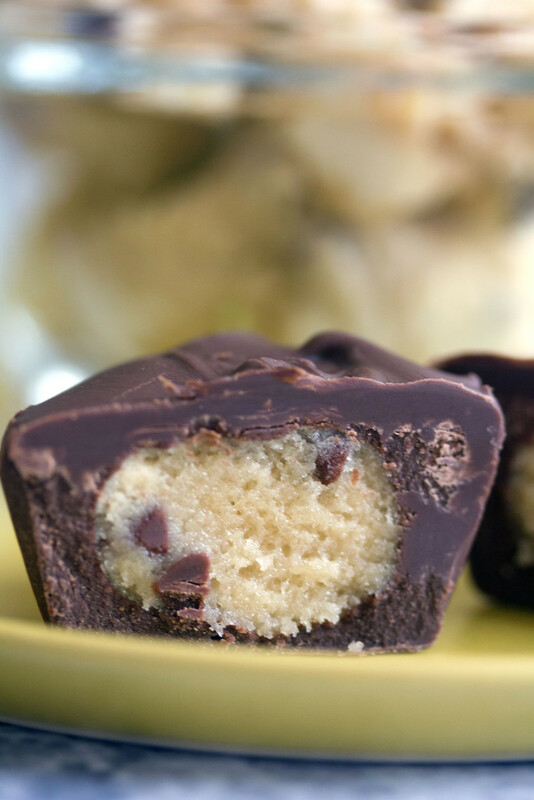 Yes, these truffles are really just chocolate chip cookie dough balls covered in chocolate. I was going to make peanut butter cups but then cookie dough just felt like a better idea. Not that you could really go wrong either way. The hardest part it not just giving in and eating the cookie dough with a spoon. But you can do a little bit of that, too. 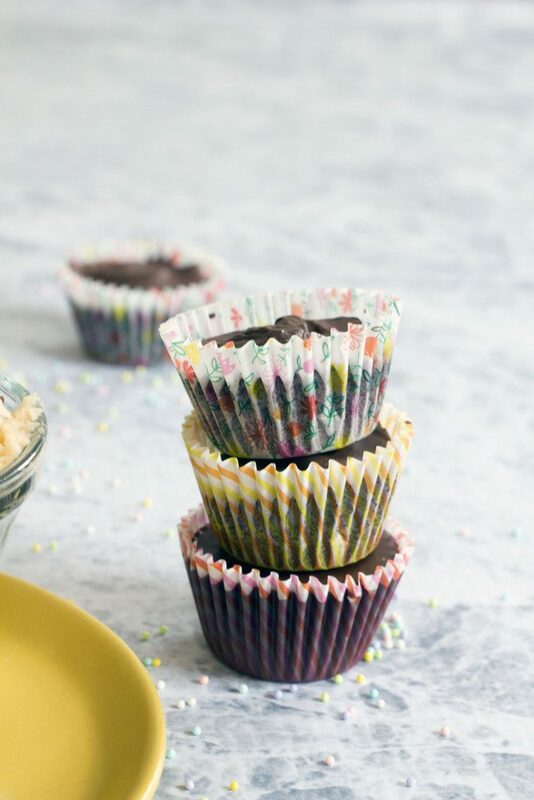 Pretty little baking cups make these even more fun and potentially festive. For real, there is not much better than a cookie dough you have full permission to eat… And covered in chocolate, at that. With the holidays coming up, I can pretty much guarantee your friends and family would love to get a little chocolate chip cookie dough cup gift package. Or you know, if you’re attending any holiday parties, these make the perfect bring-along treat. And since they take barely any time to make, you’ll have more time to go shopping, sing Christmas carols, wrap gifts, or you know… Sleep. Or I guess work, if you’re into that kind of thing. Thank you, Jessie Spano, for making me not feel so alone. And thank you Chocolate Chip Cookie Dough Cups for completing me. Who needs time anyway?? Do you feel like Jessie Spano in that you’re always running out of time? Whether you need a quick and easy dessert or you're just craving raw cookie dough and chocolate (who isn't?? 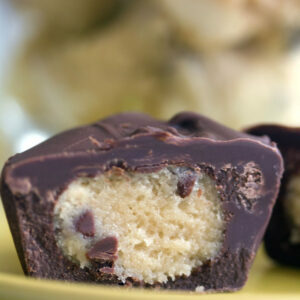 ), these Chocolate Chip Cookie Dough Cups are a perfect treat! Slowly beat in flour, until combined. Stir in milk. Form 12 small balls with cookie dough (you'll likely have some left over). Heat dark chocolate in a saucepan set over another saucepan of simmering water. Stir until chocolate is melted. 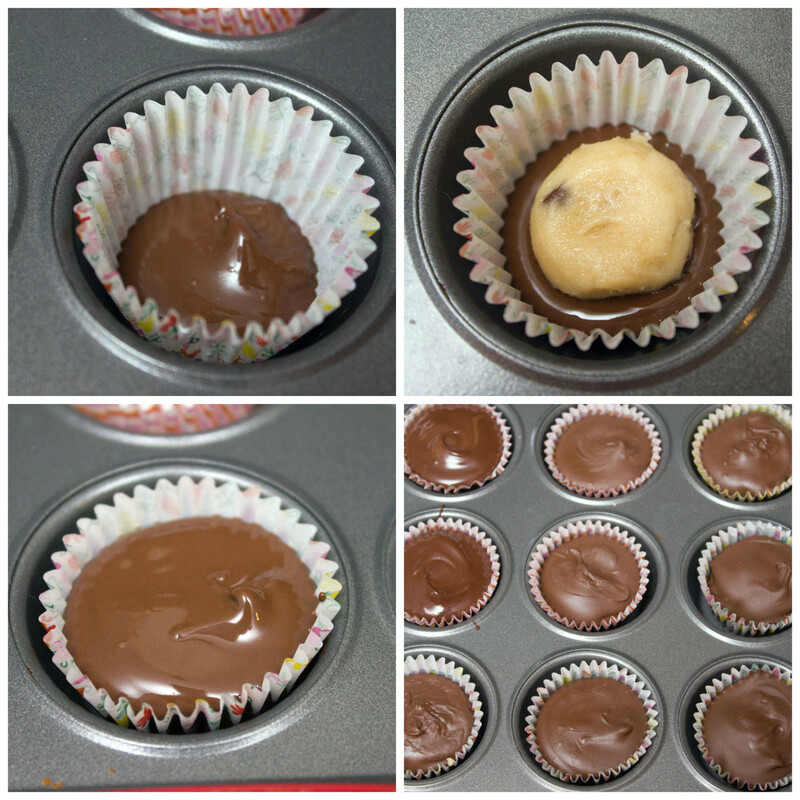 Spoon enough chocolate into the each cupcake liner to cover the bottom of it. Set cookie dough ball into center of each liner. 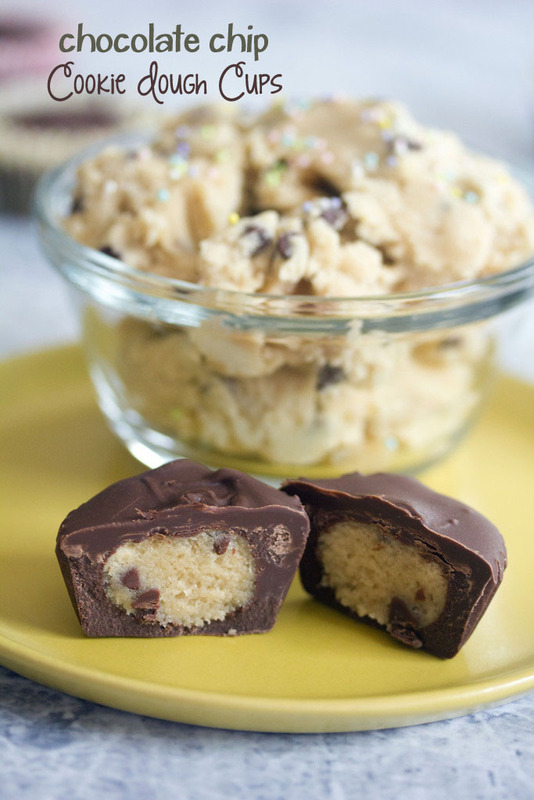 Pour chocolate over cookie dough balls to completely cover. 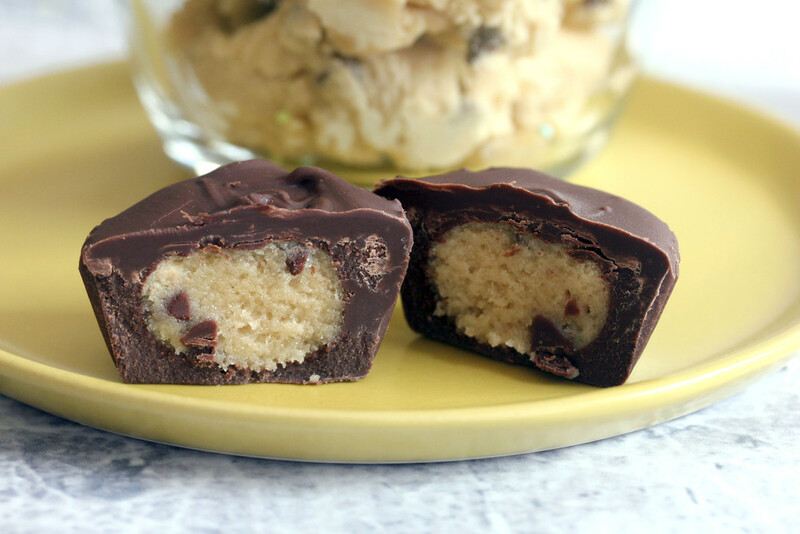 13 Responses to "Chocolate Chip Cookie Dough Cups"
You’ve awakened my inner cookie monster!! I’ve been craving chocolate chip cookies with a passion!! I finally made a batch last week. Thanks for sharing these!! LOL about Saved by the bell! 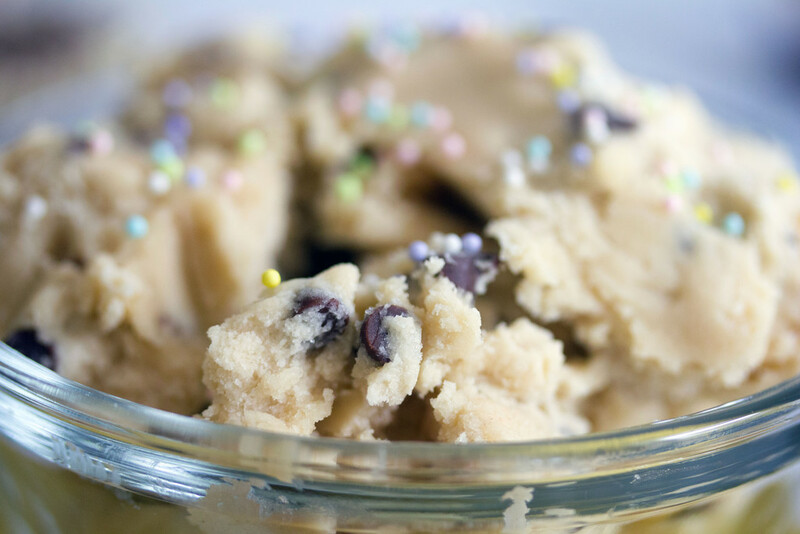 These look so good- I love that you can eat cookie dough like this! I remember that episode!! Too funny. Classic Saved by the Bell episode! 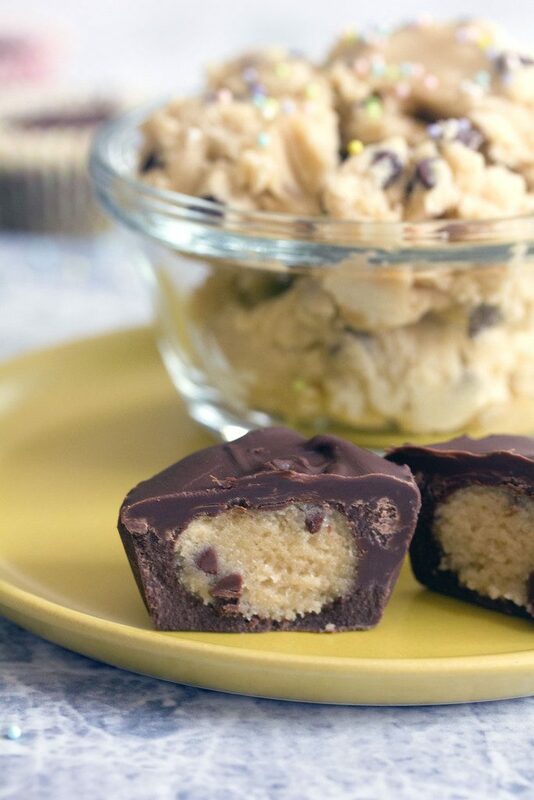 These cookie dough cups look super delicious! These look amaaaaaazing! I’d love one (or five) right now as an after-lunch treat. The holidays are always especially hectic, so I know how you feel!! I’m pretty sure I would eat all of these cookie dough cups and die from happiness. Okay, I am totally in love with this idea. It’s like a Reese’s Cup but a MILLION times better :). Can’t wait to try these! Pinned! Jessie was right. There’s never any dang time for anything. That’s why I huddle in a corner and eat cookie dough cups. Nicely played, Sues!